They say love will find you, not the other way around. They don’t explicitly say where love will find you, and for me, that was probably the most unexpected thing of all . I never imagined i’d be writing about how TEFL helped me to find love. I’ll set the scene for you; I’m about 6 months into my first teaching contract in Thailand and having the time of my life; the first term has just ended and I’ve decided to spend my break traveling through Cambodia, Vietnam and Laos. I’m about 2 weeks into my trip and sitting in the lobby of my guesthouse in Phnom Penh, Cambodia after a long day of travel. I’m not doing much, just fiddling with my iPod and taking the sights and sounds outside the front door, when behind me a hear an American-accented voice from behind me ask, “How long will you be in Cambodia?”. I turn around, expecting to see another backpacker hoping to bond over the joys and pain of traveling, but instead I found myself looking at a young, Cambodian man sitting behind the receptionist desk. “Where did he come from?” I thought to myself, that wasn’t the same receptionist who was there a few minutes ago. That is where it all began and the rest is history as they say. The conversation turned from history and information about Cambodia, to music, sports, then goals and dreams. Our conversation lasted all of four hours, but he still made an impression on me (it’s always the smile). My tickets to Vietnam for the following day had already been purchased and it was with mixed feelings that I honoured them and boarded the bus. I went 2 weeks in Vietnam and while I soaked up every minute and enjoyed the culture, my mind still wandered to that Cambodian boy back in Phnom Penh and my stomach would do flip-flops. It wasn’t until I got all the way up north, to Hanoi, that I decided to follow my heart. I changed my plans from continuing on Laos, to travelling back down the length of Vietnam and crossing back into Cambodia and to Phnom Penh. Looking back, it seems pretty crazy what I did, but at the time, it felt right. I’m a big proponent of following your heart. I think we are all intuitive beings and if we just let go of our fears, we will find a voice inside us that always has the right answer for us. Back in Phnom Penh, it only took 5 minutes for us to find each other at the guesthouse we met at. Yeah, it’s corny, but I think it was meant to be and my intuitive-self knew that. It only took a month for us to fall head-over-heels for each other, and when I had to leave and go back to work in Thailand, he fulfilled his promise to visit me; not once, but a total of 5 times. 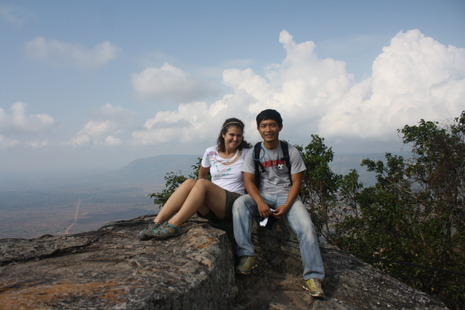 So, that is where I found love, in Cambodia, a place I could have least expected. What does this all have to do with TEFL? Well, everything! If I hadn’t found TEFL back in the summer of 2010, I never would have bought a one-way plane ticket to Thailand. If I had never found TEFL, I never would have found a job teaching English that provided me with an income to be able to travel to Cambodia. But most importantly, when I signed up for my TEFL certificate, that was the first time I truly trusted following my heart, if I hadn’t found TEFL, I never would have had the courage to trust myself when I made the seemingly crazy decision to travel 35 hours through two countries in order to be reunited with a person I had only known for 4 hours. I hope from reading this story, I can inspire others to not only believe in themselves, but to believe that there are a myriad of opportunities available to them. When you decide to teach English abroad, you are making a decision to change your life. During that summer of 2010, I longed to become the person I had always dreamed of being; an intrepid traveller with the courage to venture off into unknown territory and vanquish evil and save the world. I think that was really just a metaphor for the person I wanted to be; a strong individual who could take care of themselves in unfamiliar situations with the ability to bend with change with a smile on their face. The opportunity to teach abroad has given me just that; I have grown as a person in so many ways and I’ve found that strength, courage and perseverance buried deep inside me. I have also found love, not only for someone else, but for myself. So if you’re thinking about teaching English abroad, listen to that voice deep inside you and if it says do it, then do it. I promise you won’t regret it and while I can’t guarantee you will fall madly in love with the man of your dreams, I can guarantee you will find love… for yourself.